Flight Visualizer, track Un-filtered flights in real time, 100% free! Explore the hottest new paradigm, peer-to-peer (P2P) computing, and use the power of the JXTA platform to transform your applications into peer-aware, collaborative tools. 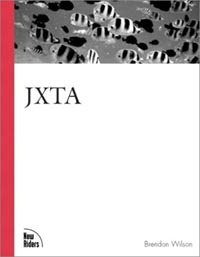 JXTA technology is a set of open source, peer-to-peer protocols that allow any connected device on the network from cell phone to PDA from PC to server to communicate and collaborate in a peer to peer manner. With the explosion of content on the network, and the existence of millions of connected devices, a multi-dimensional web or expanded web has emerged. Content is both on the edge of the network, but also resides in the "deep web." JXTA technology enables new and innovative network applications to be created, giving complete access to content on the expanded web. This book is an implementation book that covers the protocols and how to use them. Brendon J. Wilson, a graduate of Simon Fraser University's Engineering Science program (ensc.sfu.ca), is a software engineer specializing in object oriented programming with a focus on Java and Internet technologies. Brendon started using Java in 1996 as part of his undergraduate thesis project, a 3D robot manipulator simulator, which went on to win Sun Microsystems' Java3D programming competition. Since graduating from SFU, Brendon has worked at a number of hightech softwaredevelopment companies, including the ebusiness division of IBM's Pacific Development Center in Burnaby, and a variety of encryption and wireless startups around the world. Currently a Senior Software Engineer at PKI Innovations, Inc. (pk3i). Brendon lives with his wife, Ashley, in Vancouver, Canada. He can be contacted through his web site at brendonwilson.